Greetings from Mongolia! I’ve just crossed the frontier from the Russian Federation and am now sat quietly in the darkness on the Mongolian border. It’s all very Cold War again – soldiers standing to attention on the platform and immigration officers carrying briefcases ready to board and examine everyone that they find on train 004. Guard dogs roam freely on the platform. I think my paperwork is in order, but judging by the degree of close inspection my visa was given before being taken away, I’m not 100% sure. The officer who took it from me actually saluted me in my compartment – as I’m not sure on Mongolian army etiquette I didn’t return the salute, as I wasn’t wearing headgear – I hope that’s the right drill out here. I will flatter myself and assume that she knew she must have been dealing with a VIP passenger, as he had a whole First Class compartment just to himself. I have the Christmas decorations up in my compartment, and hope they help break the ice with the officials – this is hardly the normal behavior of a smuggler or an illegal immigrant surely? 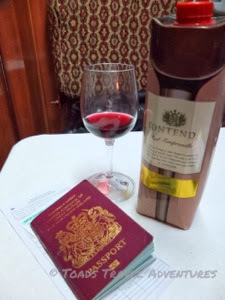 It took about two hours to get out of Russia, and about another two here to get into Mongolia, so it’s hardly fast track, but at least I can sit in my own compartment sipping a glass of Merlot reading my book (“A Captain’s Duty” by Richard Phillips). There are a gaggle of officials walking up and down as well as some “not so officials”, including a couple of women who are black market currency traders, offering local Torag at a rate I didn’t get to hear about. I’m awaiting the arrival of the Customs people, who I’m sure will be interested in my taste in Spanish wine (the best stuff I could find on offer in an otherwise dull Moscow supermarket). No restaurant carriage tonight, so I have already dined alone on smoked sausage, crackers and chicken liver pate. 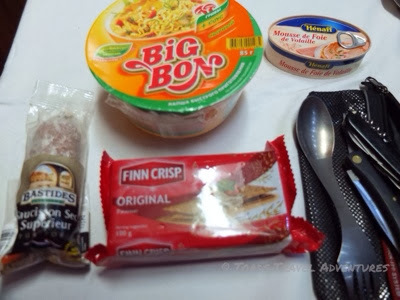 I couldn’t face the Russian instant noodles after all – maybe I will on the Chinese border tomorrow night.. The colossal crashing bang and lurching of our carriage suggests that the Mongolian part of the train has arrived and has just been attached. This is good news, as it means that tomorrow there is the prospect of beef dumplings for lunch! Yumsk. Just as I write this a very seriously dressed lady soldier in full combats and boots has been poking her flashlight around my compartment – that’s the third search of the train on this border crossing. She has left looking satisfied, so I hope that’s okay. Was I marked out for an extra search? I just need my passport to be returned now, and as the train is now moving (but backwards) I’m hoping this standard Mongolian border procedure..